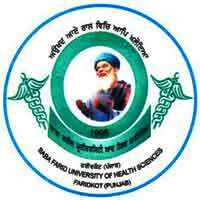 Baba Farid University of Health Sciences (BFUHS) Recruitment Notification 2018.Baba Farid University of Health Sciences inviting applications for the positions of Law Officer, Executive Engineer & Radiographer.Interested and Eligible candidates can apply for the positions. Applicants must be completed 12th/ degree/ graduate/ masters degree/ post graduate/ B.Sc in radiography with relevant experience and teaching experience from the recognized organization/ Board. Laundry Supervisor – Rs.5,910-Rs.20,200 + Rs.2,400/-. Assistant Professor – Rs.37,400 – Rs.67,000 + Rs.8,600/-. To the Office of the Register, Baba Farid University of Health Sciences, Sadiq Road, Faridkot.